At age twelve, I had already decided I wanted to be either a minister, a photographer or maybe a fireman and maybe even a football star. Today, many years later, primarily as a life long photojournalist, I see that I was best able to recognize and capture on film the truly heroic saints among those of us who appeared to live ordinary lives in ordinary places. At age 28, while a staff photographer for the Seattle Times, I was awarded the Pulitzer Prize for news photography in 1975. 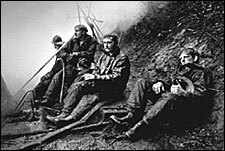 This prize winning photograph entitled, "Lull in the Battle", powerfully depicts firemen in a moment of deep reflection after battling a house fire. The photograph speaks of courage, dedication and humanity during the troubled times of the Vietnam War, when many thought our country was other than courageous, dedicated or humanitarian. Like all of my photographs, this picture allows us to travel beyond the obvious and capture the essential about the individual as well as the collective. It urges us to take another look and remember who we are. Numerous times during this multi-media career my peers have acknowledged my photographic eye. In addition, to the Pulitzer Prize, I also received the first Edward Steichen Award for news photography and was named regional Photographer of the Year in 1974, 1975, 1976 and 1977 by the National Press Photographers Association, an organization for which I served as President. I also served on major newspapers across the country including the St. Paul Pioneer Press, the Los Angeles Times and New York Newsday. To fully explore both human and spiritual life, I recently took to the back roads of America. During three consecutive cross-country summer road trips, I logged nearly 50,000 miles in the 48 continental United States. Randomly, I would stop at small towns across the states and document the daily lives of citizens whose paths I had just crossed. These pictures are symbolic of simply this: Each human being as a unique and equal soul, peacefully living out their days on the Earth. It is this sacred humanness that I look for in my own life and in the lives of my photographic subjects. Now I understand that my pictures simply mirror my own personal philosophy, my love of photography, and my spiritual reverence for the Earth and the creatures that populate her. My greater prayer however, is for my photographs to inspire us to see as sacred our inner-connectedness with each other and with the Earth, while putting aside judgment of self and others to recognize that we were all created equally in The Creator's image.